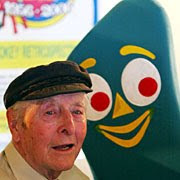 Art Clokey, the creator of Gumby and all his clay friends, along with Davey and Goliath, died on Friday. He was 88. Yet another gripe about the post office. Golf, mother-in-law and the post office seem to be a recurring theme in just about every comic strip. What do people have against the post office? I will admit that it shouldn't take five days for a letter to get across town--even Cleveland--but still. This rampant complaining of the post office is leaving a bad taste in my mouth.